When police were called to a domestic incident in Portadown a drunken woman kicked an officer in the groin, Craigavon Magistrates Court heard last Friday. 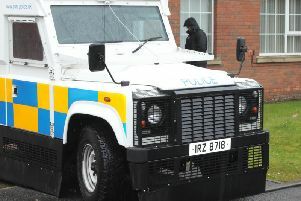 Nuala McCann (56), Ballyoran Park, Portadown, was fined £150 for the assault and ordered to pay a £15 offender’s levy. She was also fined £100 for resisting police.The court heard that around 9pm police went to Ballyoran Park because of a domestic incident and the defendant was arrested. She did not co-operate and refused to leave the house, resisting police and falling to the ground. She then kicked a constable in the groin. Her solicitor said she had been drinking vodka at her sister’s house that day and was intoxicated. He added that she had since been referred for counselling to the community addictions team. District Judge, Mr Peter King, said McCann deserved credit for her early plea and the fact that she had a clear record but it was an unpleasant incident.